Rubber Room Ramblings: SNOWFLAKE PUNCH! I seriously think I am a "Punch Addict"! Between the SU! Ribbon and SU! Punches, I ALMOST don't need stamps. Well, maybe not, but I am really loving my punches lately. This is a card we will be making at my upcoming Holiday Stamp-A-Stack. If you haven't attended a Holiday Stamp-A-Stack, you are missing lots of excitement, AND it is a super easy way to get your holiday cards made ahead of time, which makes for a lot less stress during the holiday season. Click HERE for all the class details and be sure to sign up right away, as these classes always fill quickly! 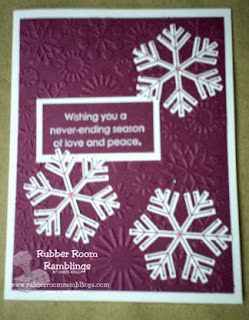 For this card I used the "traditional" holiday color, Rich Razzleberry. I made my background with the CuttleBug Snowflakes Embossing Folder. I stamped my snowflakes in Rich Razzleberry Classic Ink and then punched them out with my new SU! snowflake punch. I added a little bit of glitter in the middle of each snowflake, and I embossed my sentiment from Many Merry Messages with White Craft Ink and White Embossing Powder. VOILA, how quick and easy!